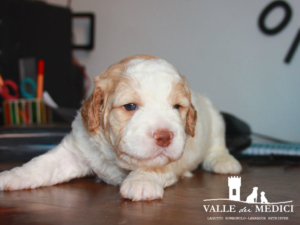 The first days with new Family, the Lagotto Romagnolo puppy often discharges stress due to his insertion on the diet. Loss of appetite. The puppy should have a daily growth in order not to remain behind in a very delicate period of physical development. It is allowed to use wet food from puppies to stimulate the appetite. Once the puppy has settled and even the feeding is regularized, checking the weight of the puppy helps to understand if the amount of food that we administer is adequate. The weight of the puppy and the increase in weight over time helps even to understand what the adult weight of the Lagotto will be. Those who adopt one of our pup often question themself about the increase in weight. Sometimes it is pure curiosity to know the weight of the adult Lagotto. Other times there are doubts about the right feeding of the puppy in terms of quantity as well as quality. Overly fat and weights puppies endanger themself bone structure with consequences also on quality of their life. The one below is a reference for the weight of the puppy. It can help to adjust the amount of food or to eliminate some curiosity about the adult Lagotto weight. The data below are references based on experience and not scientific data. The purpose of this information is exclusively to alert ourselves to significant differences and eventually to consult a VET. The photos were sent to us by the enthusiastic owners of the puppies adopted at our breeding.